We took a day trip to Reims, France during our stay in Paris. It was well worth it to see the champagne region and I highly recommend going if you are ever in the area! First things first. 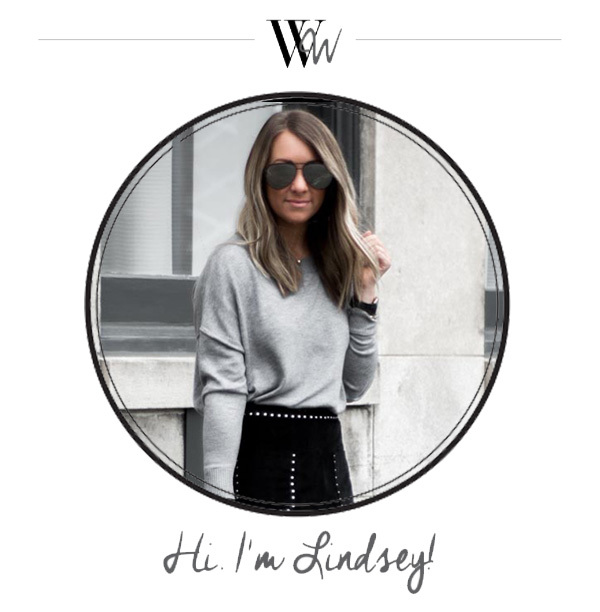 If you missed my previous honeymoon recap posts, then be sure to catch those before reading this. Since we planned to move around quite a bit during our two week vacation we initially did not plan on doing any day trips while we were in Paris. But as our honeymoon approached, we began to re-think that. I like a variety of wine + spirits but in my book, nothing beats a cold glass of champagne. Ethan loves bubbly too. 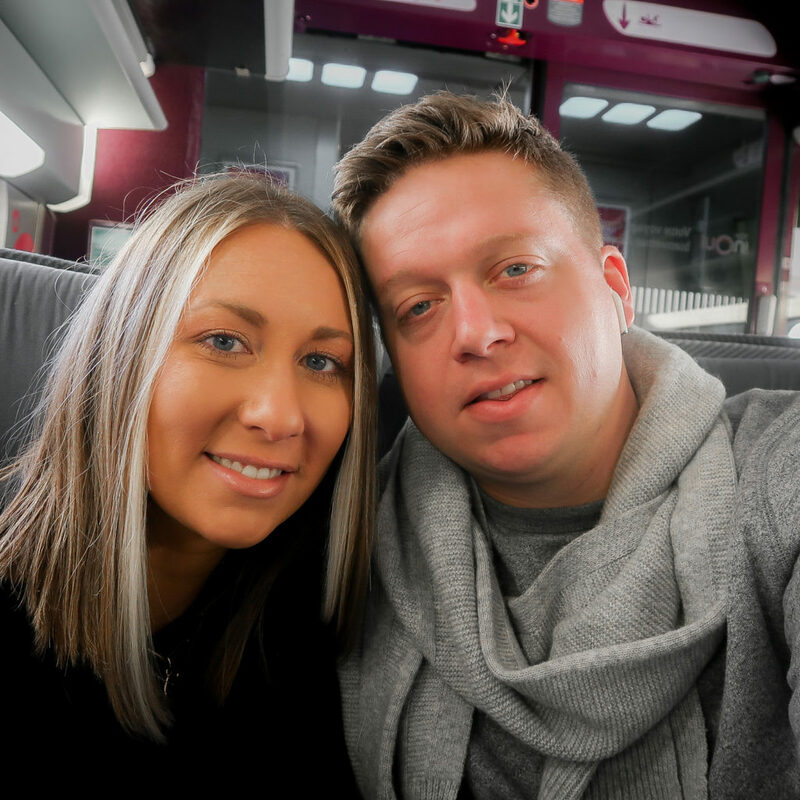 With that in mind, we decided it would be a shame to be THAT close to the champagne region and not experience it so we booked an afternoon trip. I am so glad we did! Reims is a city in northeastern France where most of the champagne houses of the world are located. 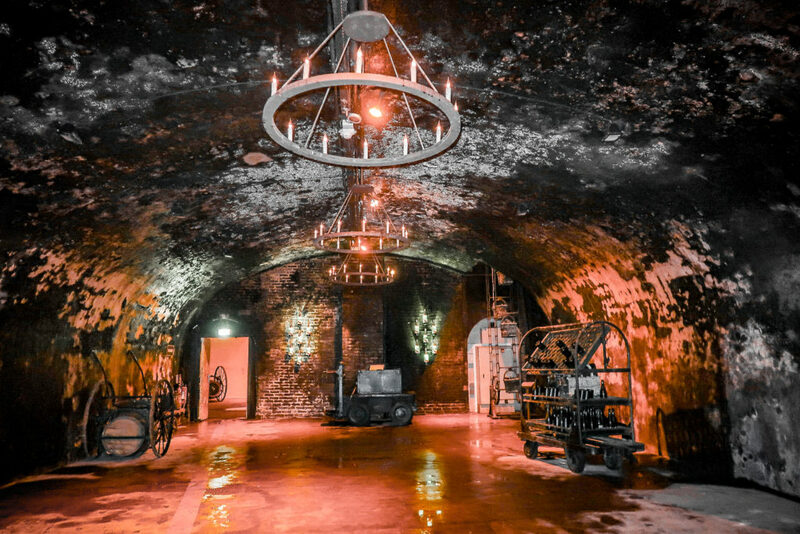 The bubbly ages in the tunnels and caves that exist below the city. Our tour guide described the underneath of the city as a block of swiss cheese because of this! They are no longer able to create new space underground, the city is at capacity. 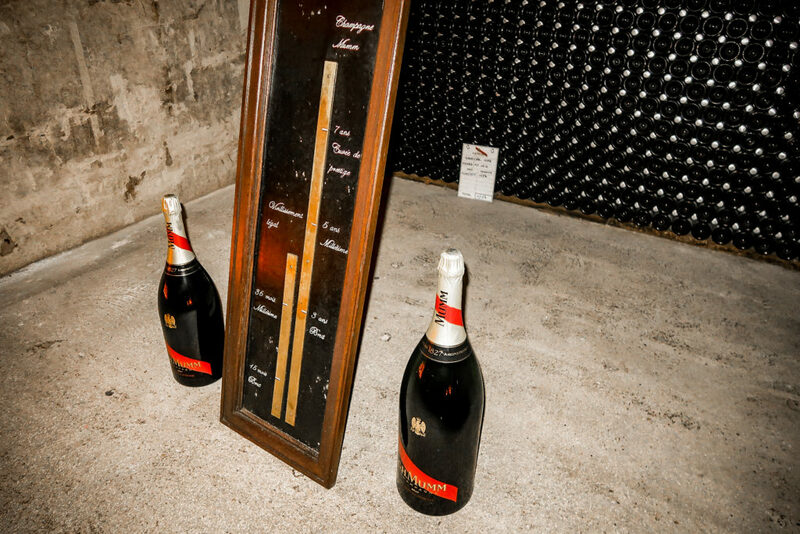 That makes this area that much more special and is one reason why these champagne houses are as famous as they are. G.H. 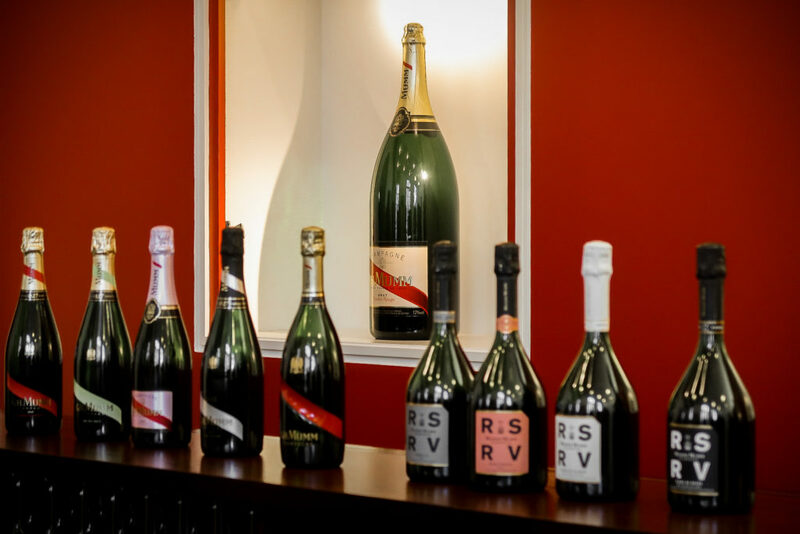 Mumm, Veuve Clicquot, Taittinger, Ruinart, Drappier, Lanson, G.H. Martel & Co. Note: That is not even a complete list! There are additional smaller champagne houses found in Reims too. && other towns close by also house additional champagne cellars. 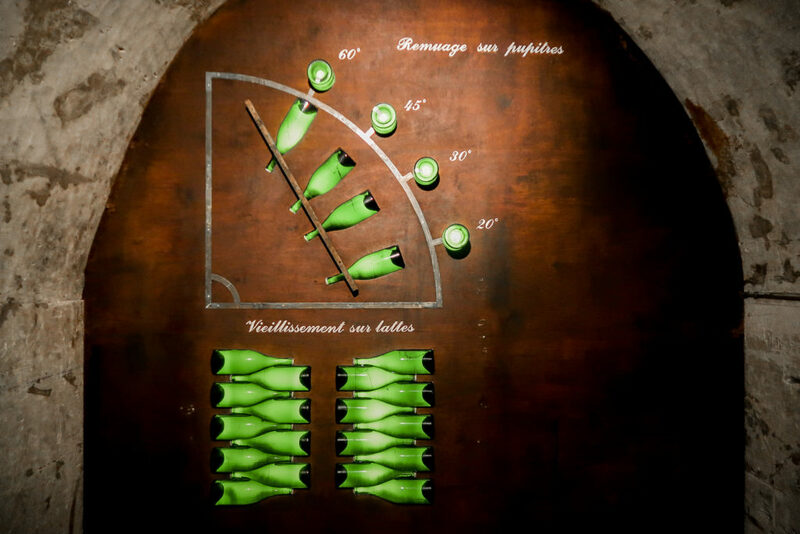 One being Epernay, where you can find the Moët & Chandon cellars where Dom Pérignon is produced. We visited on a Friday afternoon in mid-February and found the town of Reims to be quiet and a slightly deserted. We enjoyed wandering around the streets and had a nice relaxing afternoon but were surprised at how there was not much going on. I expected it to be more touristy but while we were there it was not this way at all. It was quaint and did not have many businesses other than the champagne houses. Even the entrances to the headquarters are fairly understated. Not what I expected at all! There is more history to Reims, but for obvious reasons I am choosing to only focus on the champagne highlights! Ha! You may want to do some additional research before you visit if you want to explore more though. Reims is less than 100 miles from Paris and it only takes about 45 minutes to get there by train. We booked our tickets before we left home through GoEuro (which is now Omio). There are several time options to choose from so taking just a day trip is easy. We paid $114 for two round-trip tickets. The train seats were comfortable and it was very relaxed travel. The station you arrive in once you get to Reims is small but there were several cabs right outside so we did not have a hard time finding a ride once we arrived. If the weather is nice and you have time you be able to to walk. 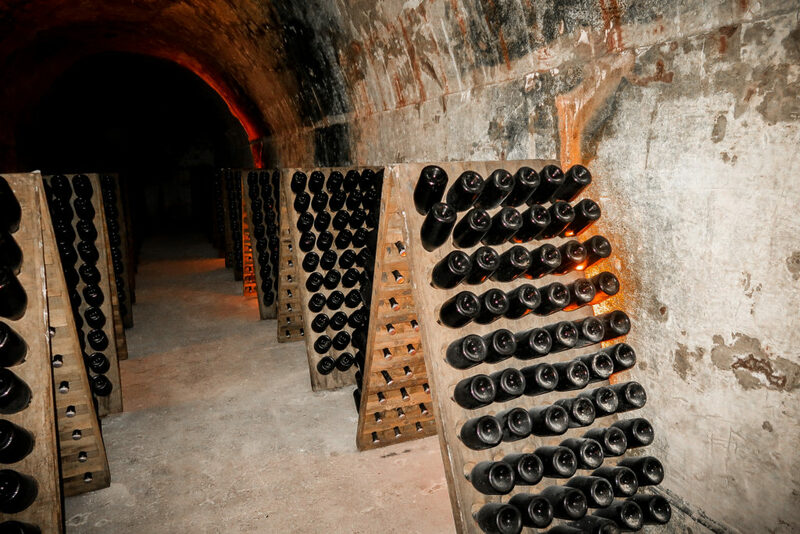 From the station to the champagne cellar we decided to visit, G.H. Mumm, it was a 15 minute walk. If you do decide to take a cab from the station to your specific destination in Reims then I suggest having cash for payment since they will not want to take a card for a minimal charge. We planned to get something to eat before our cellar tour but did not research a restaurant ahead of time. It was a little hard to find somewhere to eat just by walking around. On the streets we walked we did not see much and a few places we went into had already stopped serving lunch for the day. The impression we got was that the places are small and someone local is making fresh food for each meal. 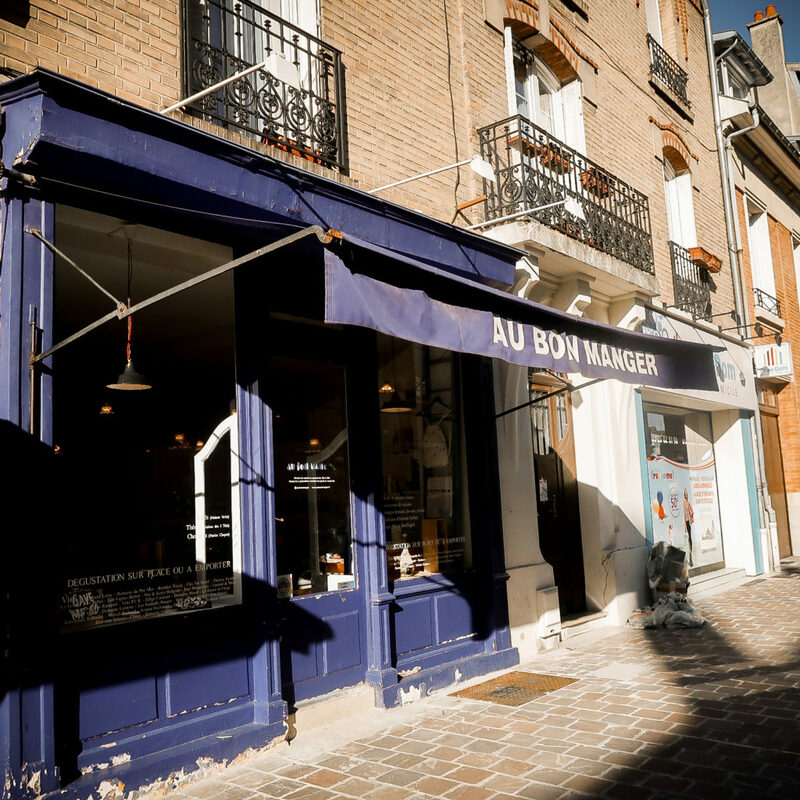 Once they have served enough for the day, they call it quits so I would suggest looking up somewhere specific to eat ahead of time if you plan to dine while in Reims. We stumbled across this tiny deli and were able to pop in for a bite to eat before our tour. They only have a couple of tables and employees but the food is truly amazing. 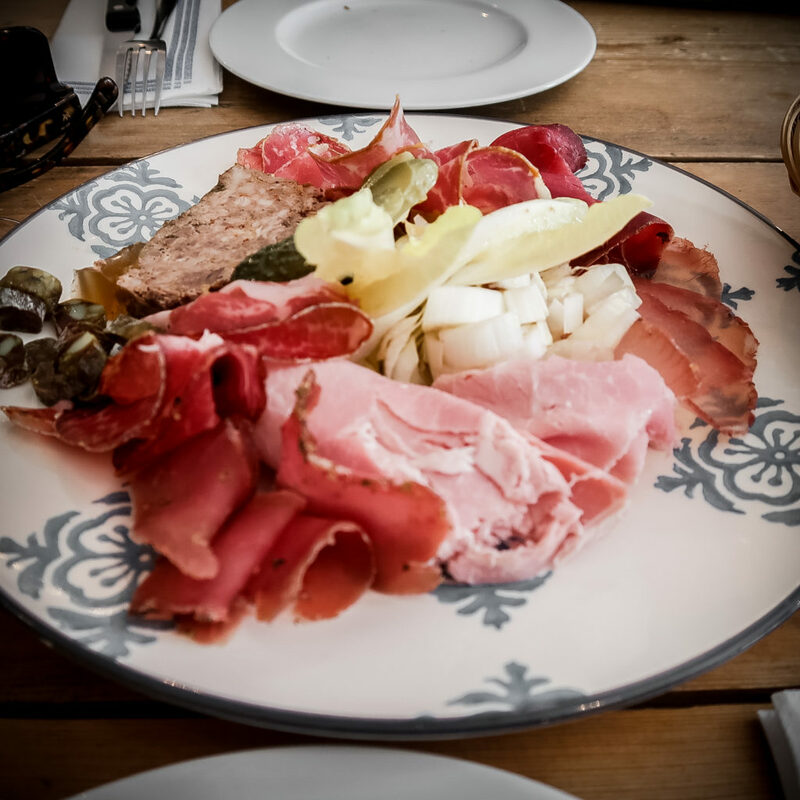 They have a wonderful selection of fresh meats and cheeses that they get daily. 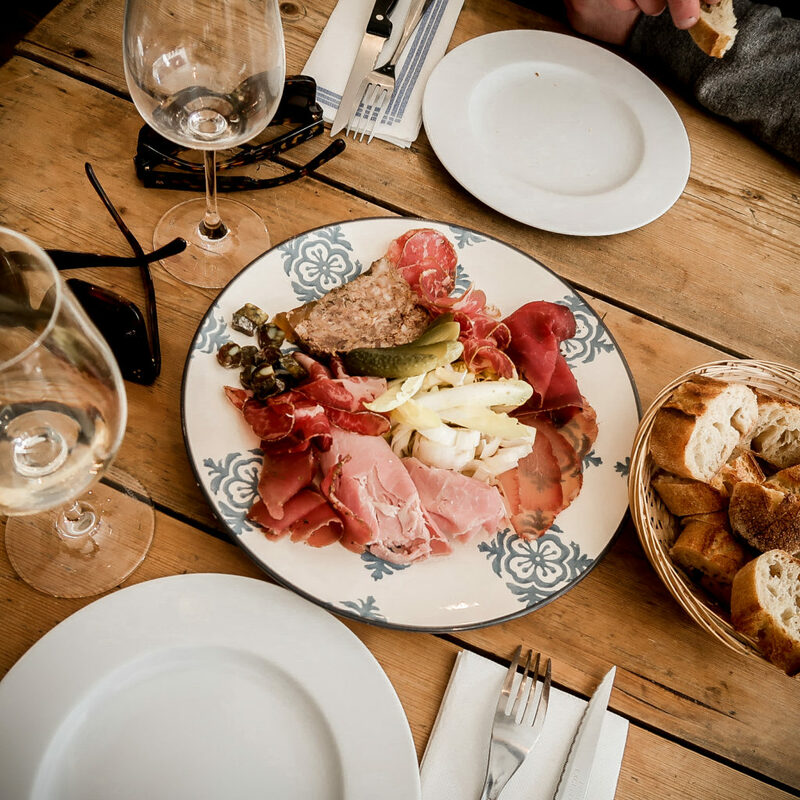 We shared a mixed charcuterie tray and each had a glass of wine and slices of bread. It was the perfect afternoon treat and we loved the experience. It felt like we were nestled right in the middle of a french town (we were!) eating at a local spot. The owners did not speak much English but they were able to communicate with us just fine and were incredibly nice. It was the perfect start to our afternoon in Reims! Highly suggest going here! My only regret was not ordering champagne to drink. We were a little caught off guard with the menu and ordering process so we just asked for any white wine. It was fabulous, but in hindsight we definitely should have asked for champagne considering where we were! There are many different groups that you can book full guided tours through online. 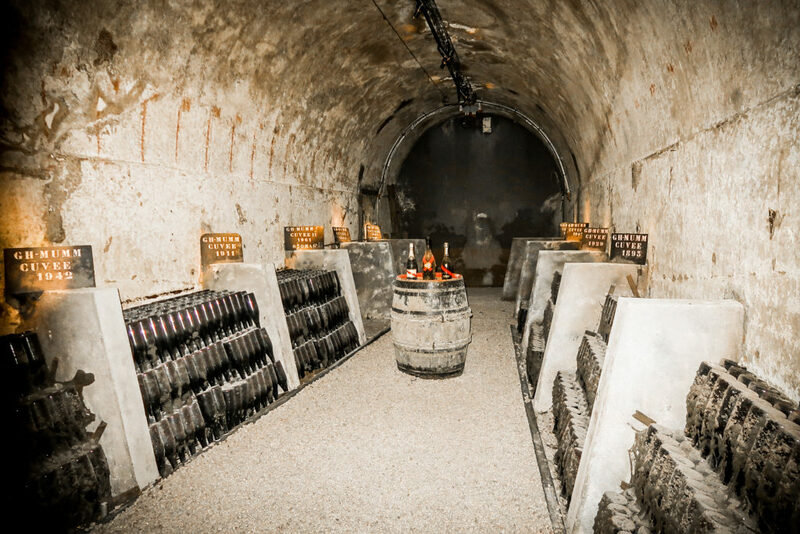 Many of those include transportation, a meal and more than one stop at champagne cellars. We are not big on group activities (especially when were on our own vacation) so we opted out of this option and just booked the day ourselves. We tried to book a tour at Veuve from their website but it was sold out. So we moved onto G.H. 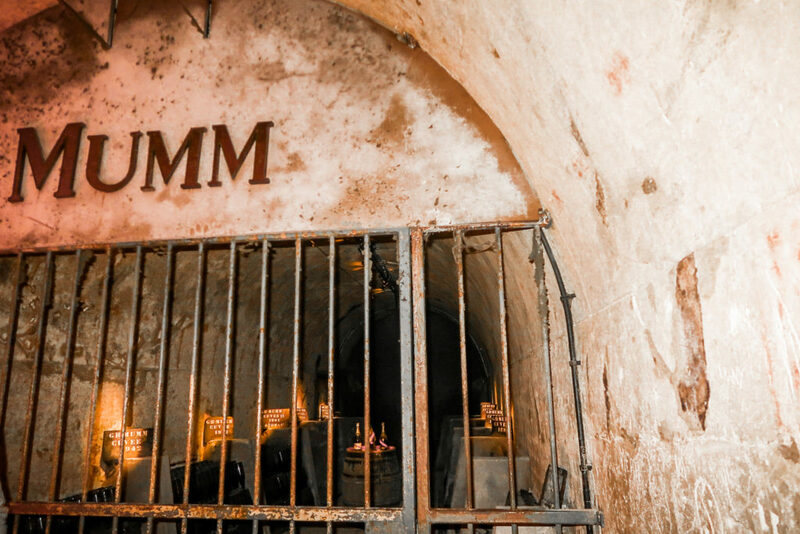 Mumm (we prefer it over Veuve anyhow, taste wise) and were able to book two spots on a tour of their cellars through their website. 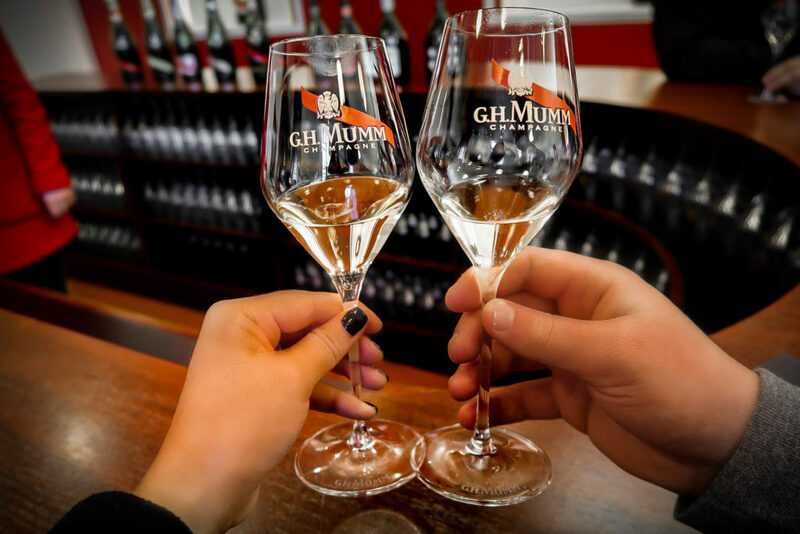 The only option available at the time we booked was for the Dare the Mumm Experience at 3:15 so I cannot speak to the other tour options. The total for our both of our tickets was $66 and this included an hour long tour and glass of champagne. The tour ended up being wonderful and super enjoyable. They keep the groups very small, only around 10-12 people were in our group. Our guide spoke english and was so knowledgable. 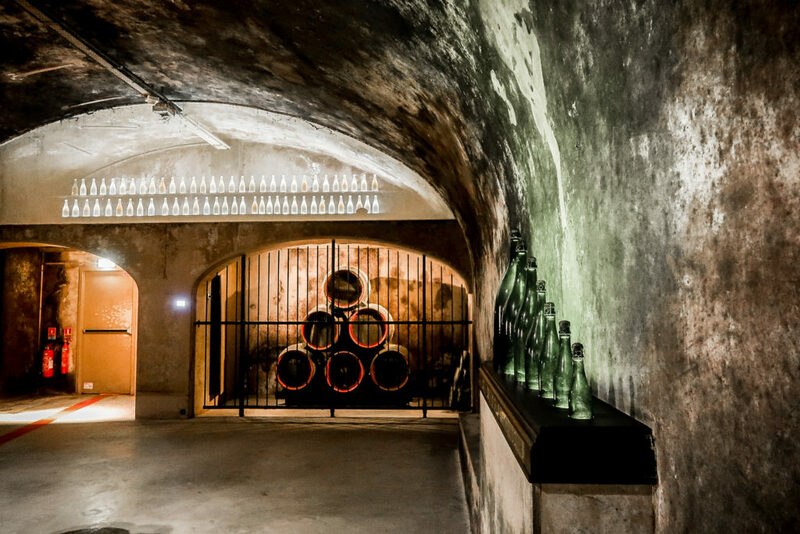 They take you far underground into the actual tunnels where the champagne is aged and you are able to see the whole process. Being down in the caves is such a neat experience. The tunnels are wide and lit so I was not claustrophobic but it is crazy to be that far underground. You can even feel the walls and they are wet from the moisture! We loved learning about how they make the champagne and seeing how the process has changed over the years. 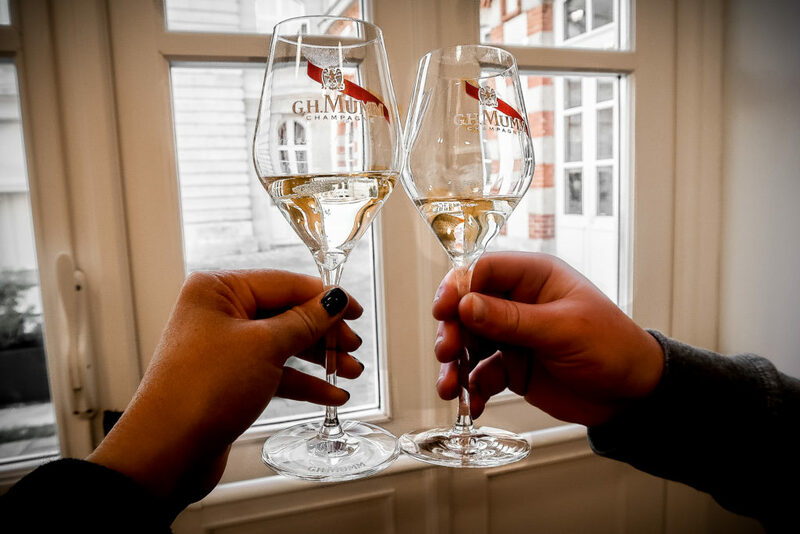 At the end of the tour you head back above ground to a tasting room where you get to try to detect different aromas (I was terrible at that part) and taste some champagne with a cheese pairing. The whole experience was so much fun. It did not seem long or boring or overdone. 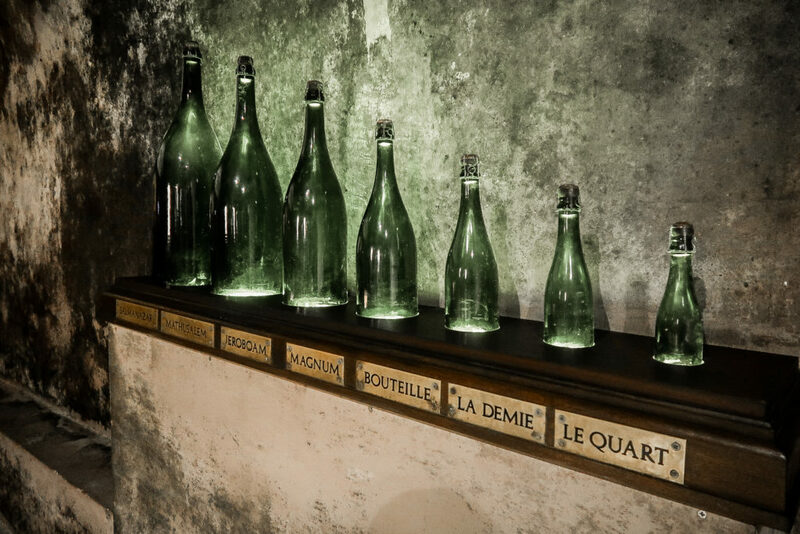 It made me want to visit other champagne headquarters in the future to compare and see what they have to offer! Shockingly (haha) I wanted one of everything in the gift shop! The space in our suitcases was very limited, but we did decided to get a couple things. G.H. 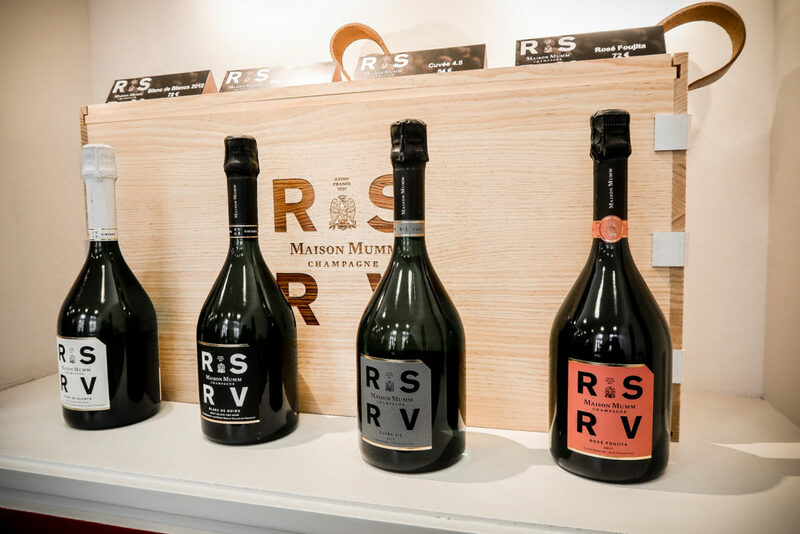 Mumm bottles a reserve champagne that is only sold at their cellars in Reims. 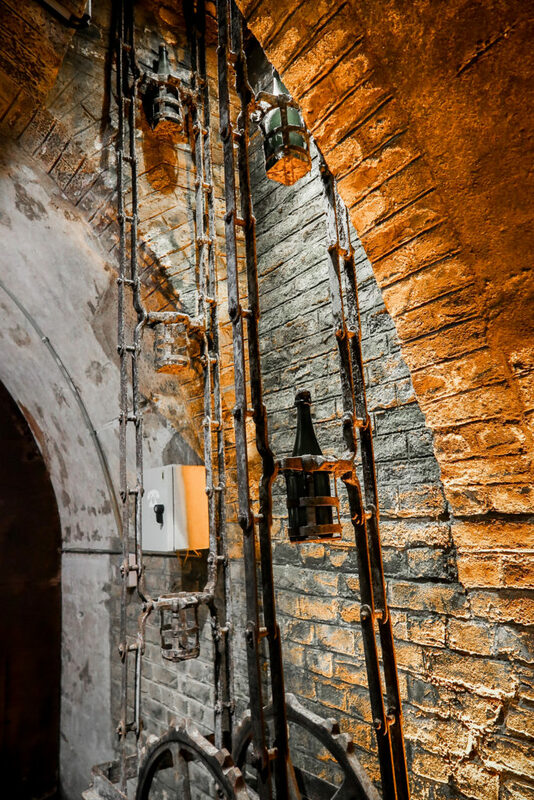 Our tour guide told us you can’t get it anywhere else in the world with the exception of a handful of 5-star restaurants that have it on their wine list. It is also reserved for purchase so only people who book the G.H. Mumm tour can buy it. They offer this exclusive bottle as a thank you for visiting the cellars. As if that wasn’t convincing enough, the bottle is also really cool. It is the one with the bold RSRV label. So needless to say we were sold and had to leave with one of those bottles too. We wrapped it in a sweater and brought it home in our checked luggage. I can’t wait to pop it for a special occasion! We also got an acrylic champagne bucket with the G.H. Mumm logo on it. It was not a heavy item to carry back on the train and we knew we would use it for years to come since it will be a fun item to pull out when hosting. On our last day in Paris we just looked up the closest post office to our hotel and went and shipped it home. We had a few other things we planned to do this with anyway. It ended up being an easy process. 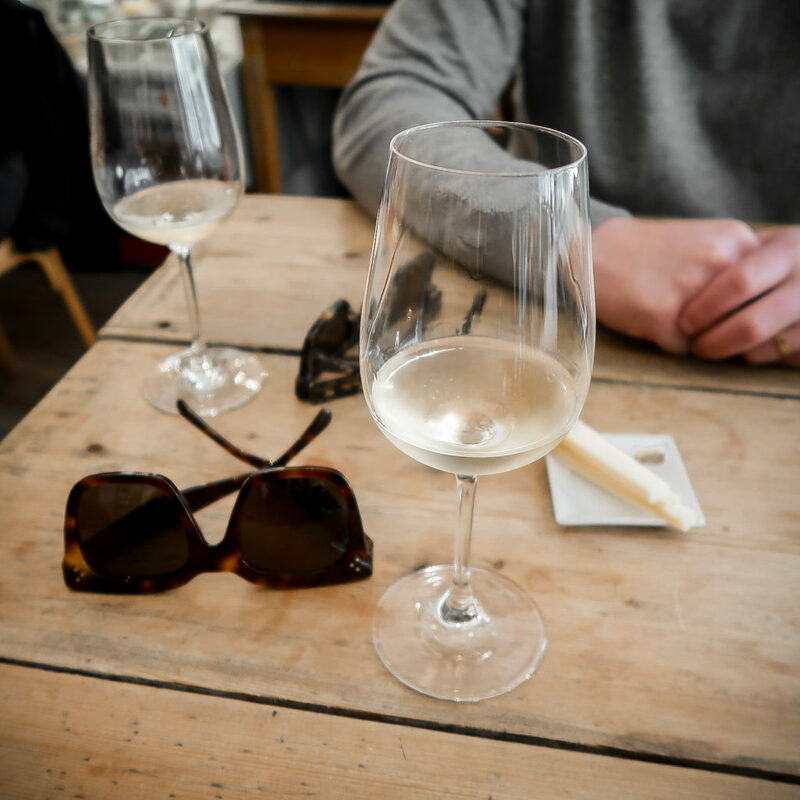 I would take an earlier train, allow for more time before the tour and plan for a tasting at a different cellar afterwards. We arrived in Reims at 1:45 and our tour G.H. Mumm was at 3:15. It took us a bit of time to find a restaurant to eat at and we had to rush once we were there. The French like to have a very leisurely lunch and we felt very rude having to tell them we were in a hurry and eat quickly. They even joked with us that we weren’t going to be able to digest anything that fast haha. So if we did it over again, I would have a restaurant picked out and allow for more time to enjoy a snack there beforehand. I think we would also take an earlier train so we’d arrived in the city sooner. We figured we would want time in Paris to get coffee and not be rushed getting out of the city so we booked the 1:45 but it would have been nicer to arrive earlier in Reims so we were already there at the beginning of lunchtime. Our tour at G.H. 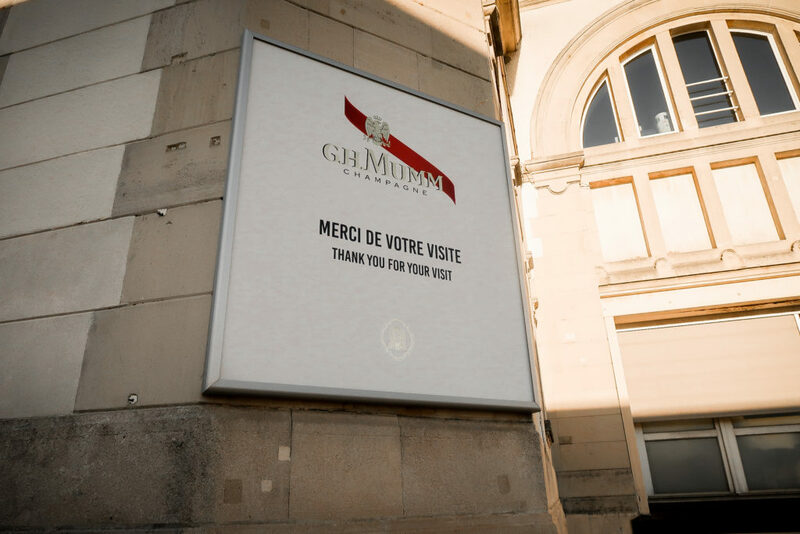 Mumm ended at 4:30 and our train back to Paris departed at 6:45 so we assumed we would be able to pop into one of the other champagne houses and just do a tasting before heading back. But once our tour was over the city was pretty much shut down (we were there on a Friday). We were able to walk around the corner and see several of the other champagne houses but their gates were either closed for the day or their offices let us know that their tastings and tours were over for the day. In a perfect world, we would have been able to book an earlier tour at G.H. 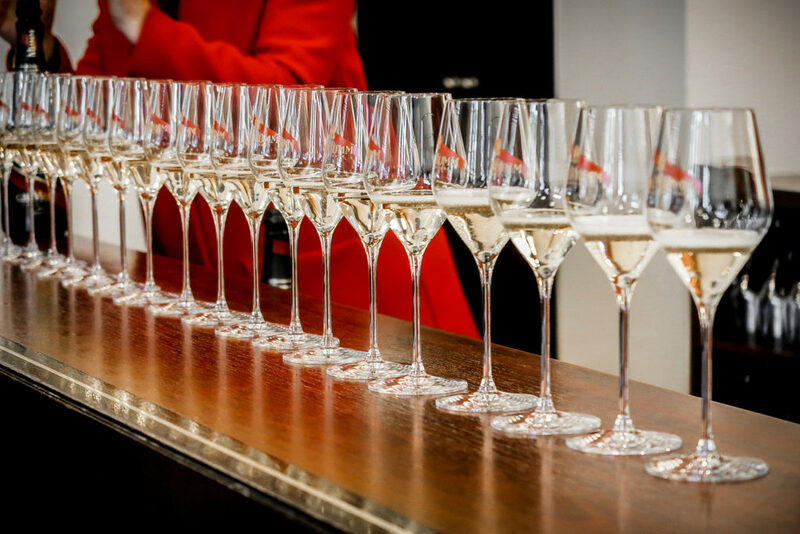 Mumm and then do research and have a tasting lined up somewhere else after. If this is your plan you will need to look into it a little further though because we were told while we were there that not all the houses do tastings for people who have not booked a full tour ahead of time. For example, our host at G.H. 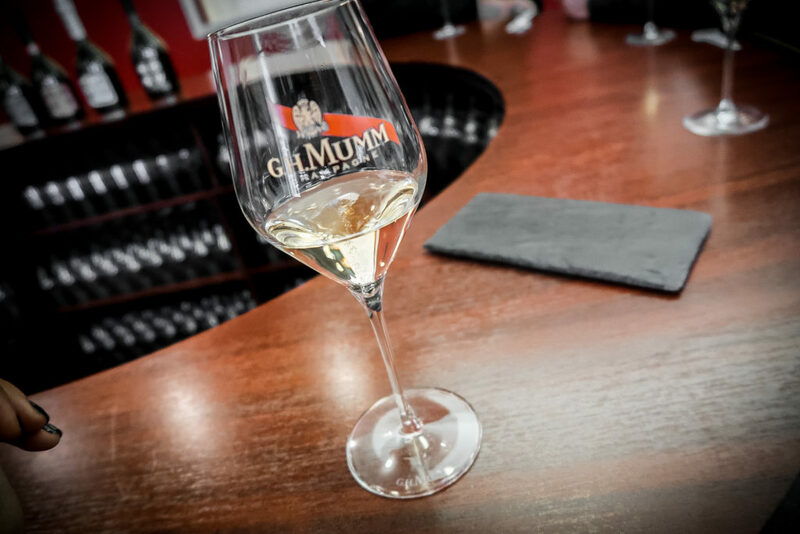 Mumm told us that only people who have been on their guided tour are able to come into their tasting room and have a glass of bubbly. YES! 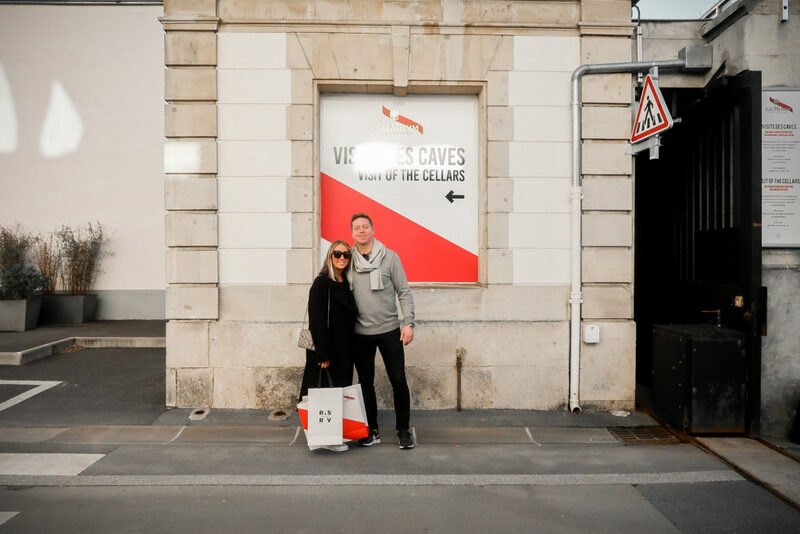 I would totally go again and we agreed that if we ever go back to Paris we would plan another day trip to tour a different cellar. We really enjoyed the experience and loved how quick and do able the trip is from Paris. My vote would be to tour Moët if we go back since that is where they produce Dom Pérignon. 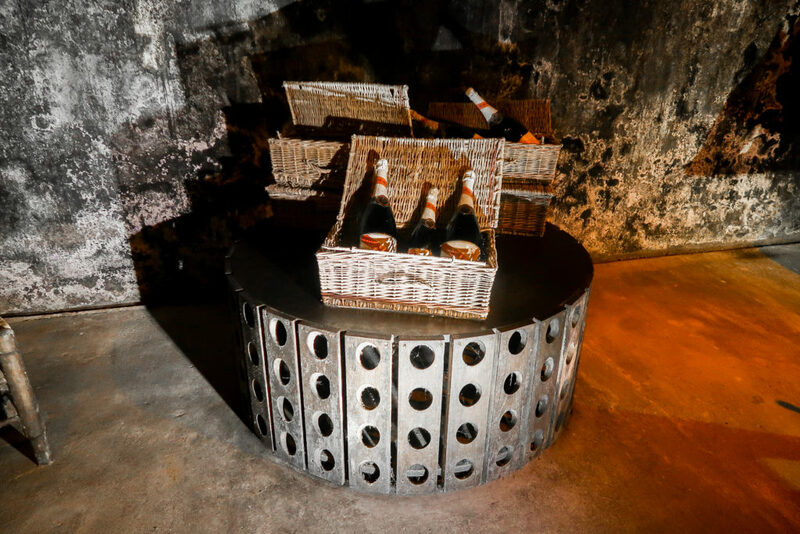 That was the very first champagne ever made (by accident) and we toured the spot where it was first brought to Paris in a barrel to be introduced to the elite society. After learning some of the history behind it, it holds so much more meaning to me. 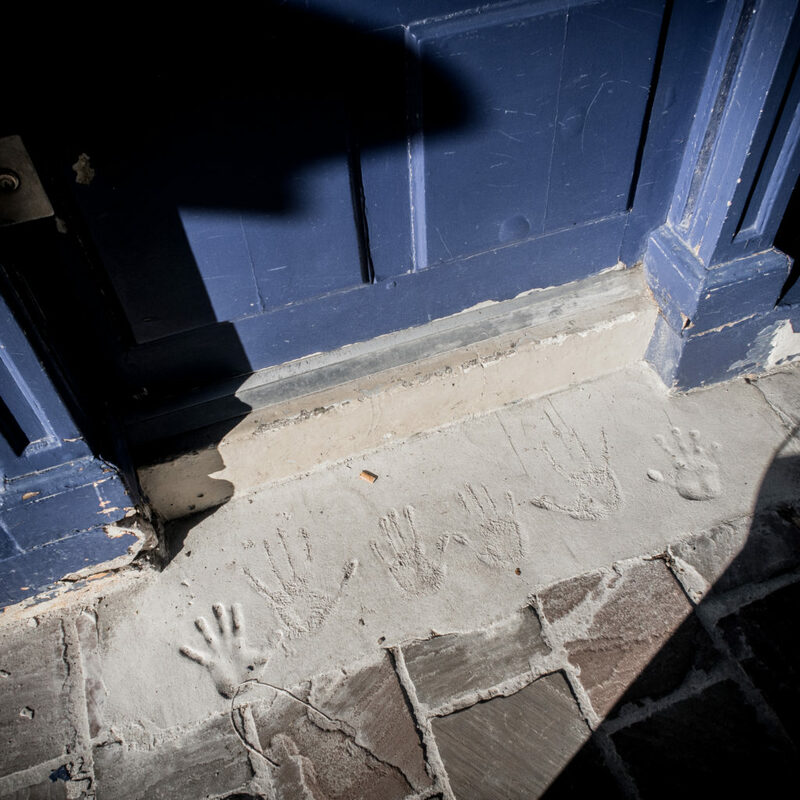 I would love to know more and get the full story and tour of the cellar! I wish we could go back and do this day all over again. And I really wish I could have another glass of the G.H. Mumm champagne right about now! 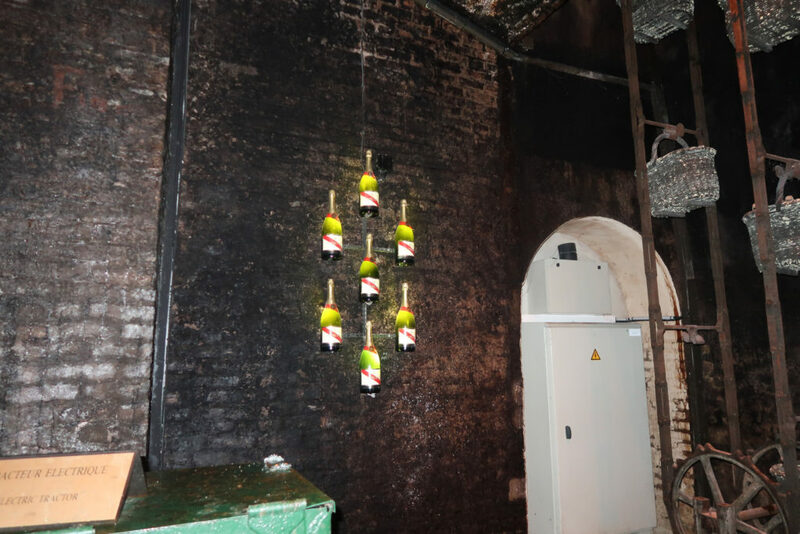 It was the champagne that won our blind taste testing that we did for my 30th birthday and now we have seen the cellars in person so it will always have a special place with me!